– 4 deaths and 15 illnesses in Colorado, Nebraska, Oklahoma and Texas. – Listeria monocytogenes can grow slowly at refrigeration temperatures in some foods including cantaloupe. 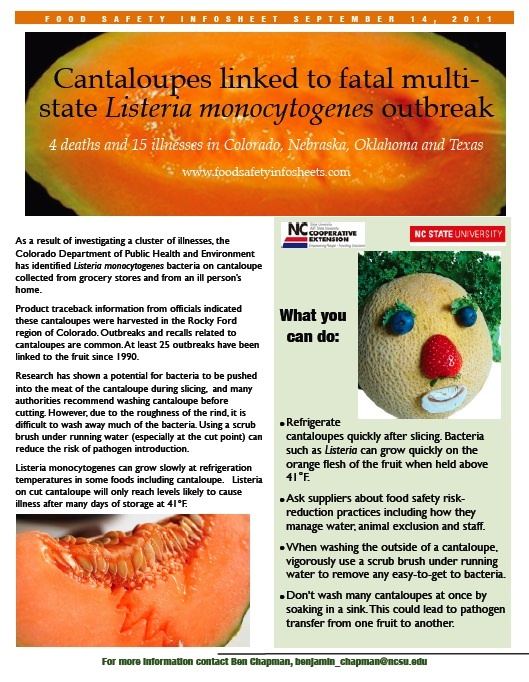 Listeria on cut cantaloupe will only reach levels likely to cause illness after many days of storage at 41°F. – Refrigerate cantaloupes quickly after slicing. Bacteria such as Listeria can grow quickly on the orange flesh of the fruit when held above 41°F. – Ask suppliers about food safety risk-reduction practices including how they manage water, animal exclusion and staff.